Mexican Turkey Bake - Eat. Drink. Love. I can never get enough of recipes for mexican dishes! This is is a unique one and I am glad you can use other types of ground meat in it. I have some ground chicken in the freezer. Thanks for sharing the recipe on this lovely one dish meal-yum! Thanks, Tina! Ground chicken would be great with this recipe! Oh yum! I love Mexican food. This sounds really good. I really love this recipe of yours..so delicious looking!!! Yummy! Thanks, Shay! It was pretty tasty! Oh yummy! We haven’t made a Mexican-themed dish at home in forever – but this sounds like just the thing to get us out of that rut! You’ll have to let me know if you decide to make it, Peggy! This looks yummy. Any idea how well it works as a make ahead meal (maybe a day in advance) or a freezer meal? I also had it for lunch the next day and it tasted just as great as it did the night before to me so I think it would be great for a make ahead meal! Not sure about freezing, I’ve never tried freezing rice actually! Oh wow this looks delicious! I’ve never had quinoa or a skinny girl margarita but, I’ve been meaning to try both. Definitely a must-do. This dish looks perfect and versatile. Plus, any dinner with Mexican in the title will be a hit in our house. We love the stuff. Great recipe! I encourage you to try both, Kate! I make lots of enchiladas and frequently have nachos for dinner but I need to get on this Mexican bake trend. 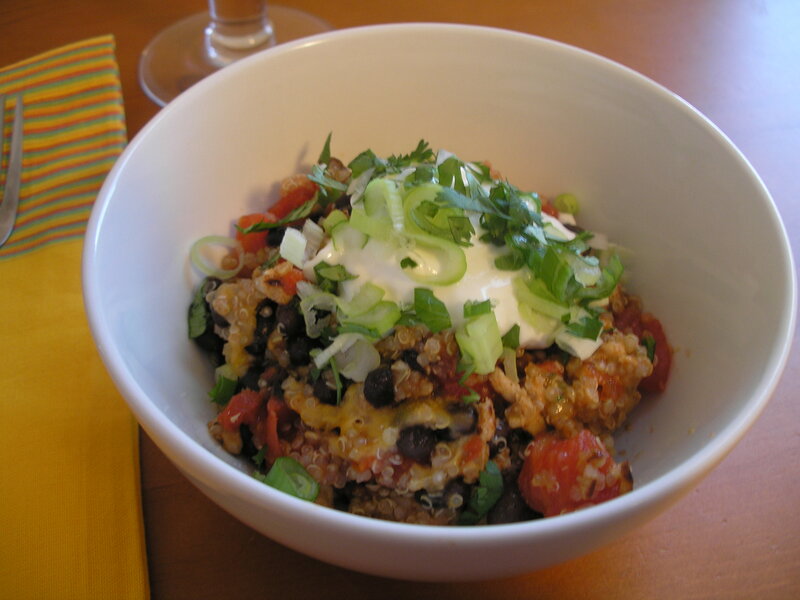 Its just like a tamale pie only with quinoa. That bowl looks delicious! What great flavors…and that it has turkey and quinoa – that’s cool! I like Mexican Turkey Bake! Thanks, Ann! I like it too! I love that this is made with quinoa. I will be trying this soon! I am looking for a winner of a quinoa recipe! I hope you like it, Erin! You’ll notice that a lot of my recipes have quinoa. I find that it is really easy to adapt to asian and mexican flavor dishes in place of rice! No turkey for me, but I’d love to make this with tofu or seitan! I bet this would be great with tofu or seitan, Tiffany! This sounds fantastic, especially with a Skinny Girl Margarita :) Those recipes we’ve been making forever are always best! I love how you said you can just throw it all together, those are often the best meals! And with a skinny girl marg (or two!) on the side sounds perfect! This dish is just my taste (wait, who doesn’t love Mexican!?!). I’m always looking for a good ground turkey recipe; thanks! Love the use of quinoa here!! Great idea. Love this delicious bake!!! what a wonderful use of flavors…. I’m so making this for my girls nite soon. Lovely Indeed. I hope you gals like it! Let me know how it turns out for you! The protein content is definitely through the roof on this one! Thanks, Ramona! I totally agree! I love that you used my favorite ingredient – quinoa! This is a perfect meal for a busy weeknight. It’s quickly becoming one of my favorites too! I love Mexican food! This looks so yummy! Gaaaah! I love how you “healthified” this dish by using turkey and quinoa. It looks awesome! Thanks for sharing. Hi Stephanie, on the mexican turkey bake…..says 2 cans diced tomatoes, what size cans? I figure regular size cans on the black beans. Thank you ahead of time for responding! Yes, around 14oz! Sorry about that! Hi Stephanie, I fixed the Mexican Turkey Bake but used grass fed organic hamburger and it is a delicious dish! The only thing I would change is the 2 cups of water, way too much because I ended up draining the canned tomatoes or I would of been overloaded with water. Next time I will use less water and keep the juice from the canned tomatoes. I think a cup of water would be plenty. I’ll let you know the next time I make it. Such a satisfying dish. Thank you. 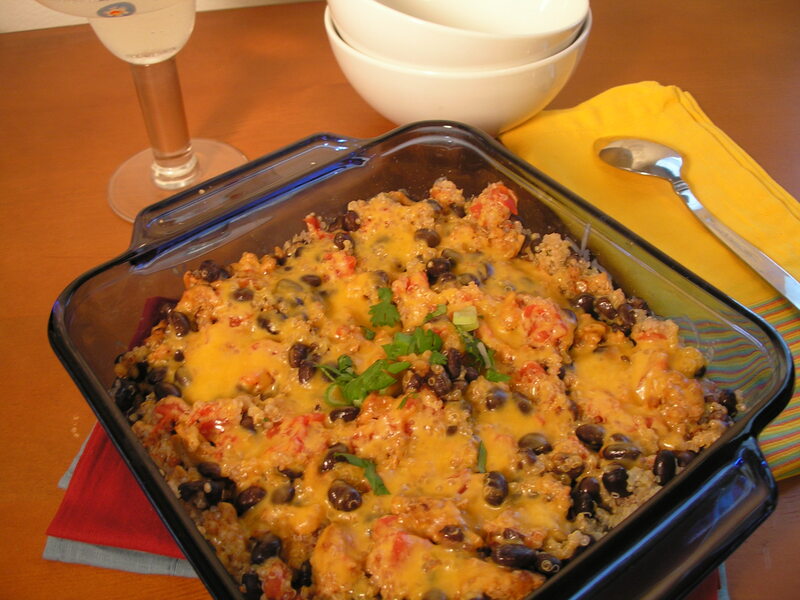 Pingback: Flashback Friday: Mexican Chicken Bake - Eat. Drink. Love.